This week is going fast! Last night I got back from a little car camping trip up north. It was a fun experience as well as being enlightening. Will there be more car camping this summer? Probably. Would I do things differently? Definitely! 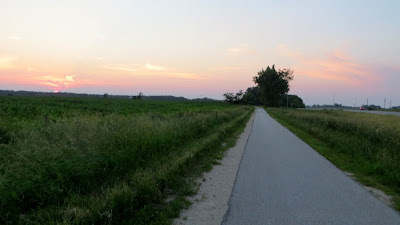 On Monday I packed up the Impala and headed north with only one destination in mind – the bike trail that leads from Calmar, Iowa to Cresco, Iowa. Last fall I had ridden the northern part of the trail but not the lower end. Each time it was planned, something else came up. Once again, that was nearly the case. 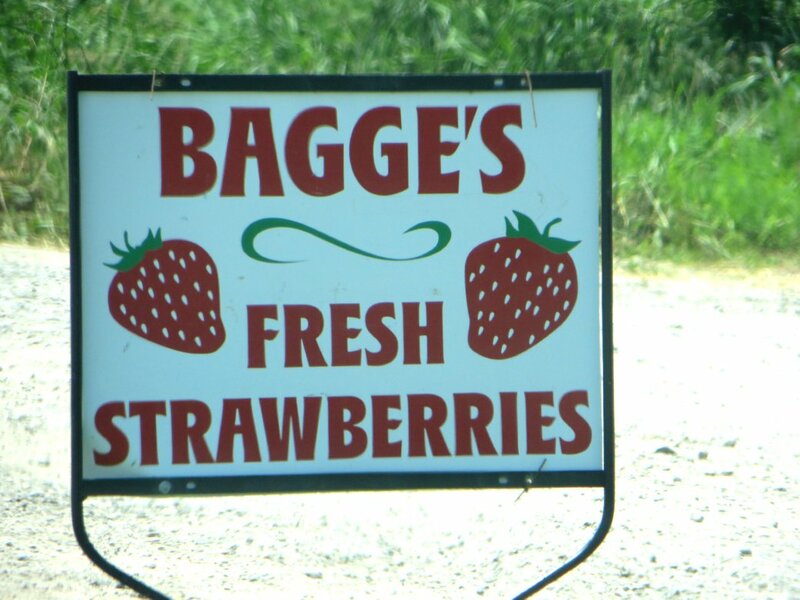 On the way north, I was lured by a sign that offered fresh strawberries. 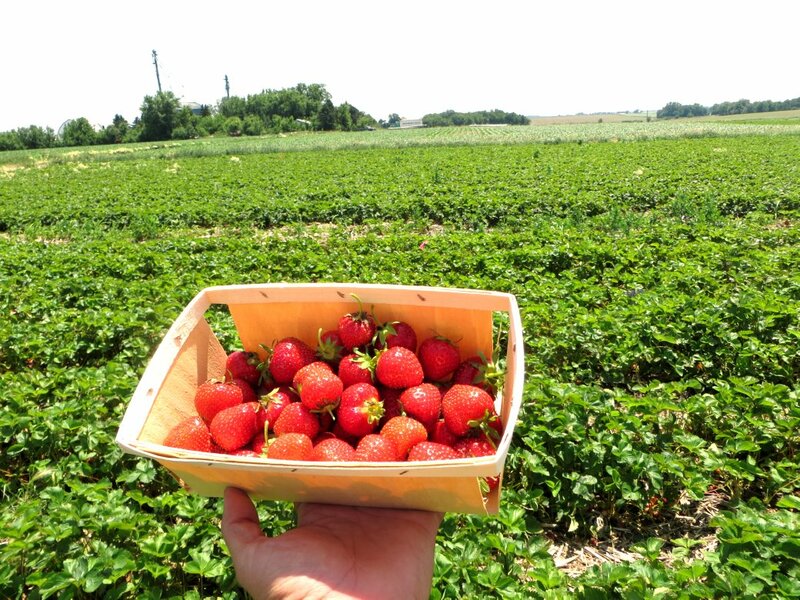 Who can resist this wonderful early summer fruit? The Iowa weather was beautiful – about 75 degrees with low humidity. 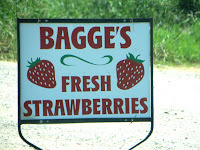 After parking a kind young lady gave me a ride to the strawberry fields in a little golf cart. It rode like a Chevy Aveo… maybe a little better? 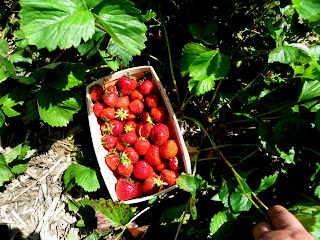 Picking the strawberries took some time. 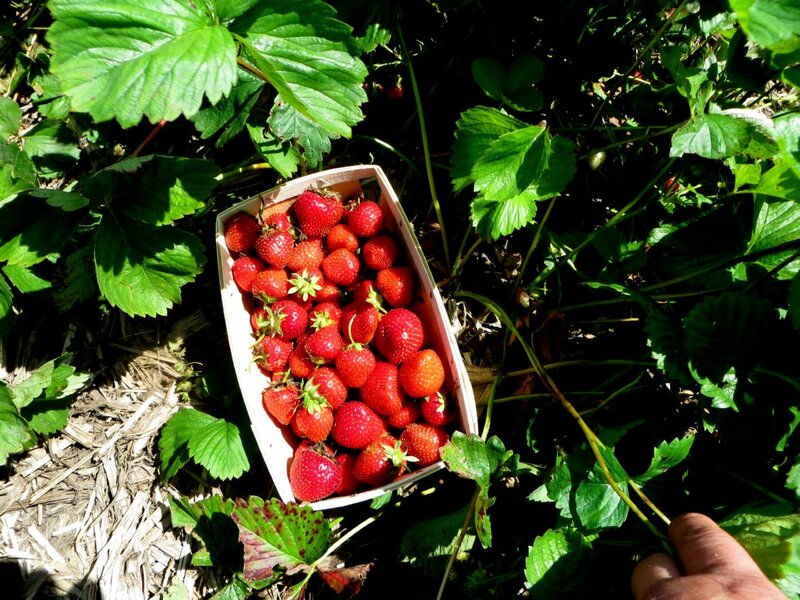 The recent heavy rains had damaged some of the berries, however quite a few were still in good shape. Suffice it to say a number of the fruits did not make to the basket. Stealth applies to berry snitching just as much as it does van dwelling! The total price for the little basket of berries turned out to be $3.91. From there it was on to the bicycle trail about 40 or so miles to the north. Well, not exactly. I had remembered seeing some wonderful looking raspberries at Otter Creek (a new favorite place to fish) which was a short diversion from the highway. Unfortunately, the lovely fruit vines bore reddish-green fruit… a week or so from being ripe. All was not lost. There were fresh tire tracks in the mud. The trout stocking truck had been here recently. Once again the trout fishing bug bit and I stopped, fished for an hour or so, and pulled out five lovely fish, pausing to clean each one on-the-fly, putting it in a bag, and weighting it down in the water with a rock. (I call it the “ziplock stringer”). 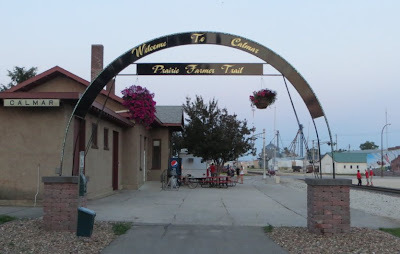 By this time it was getting later, about 5:30 PM but there was still a bit of time to go bike riding… It was on to Calmar – now or never. 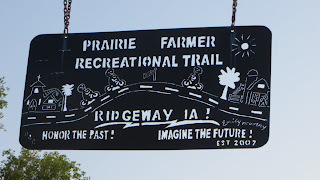 The Prairie Farmer Bike Trail has been around a few years and is in pretty good shape. Like many asphalt paved trails, you have to keep an eye out for cracks and potholes. This trail is moderately hilly, something I did not account for. The bike that went on this trip was my 20 year old Raleigh cross bike. It’s aluminum but still pretty heavy by today’s standards. 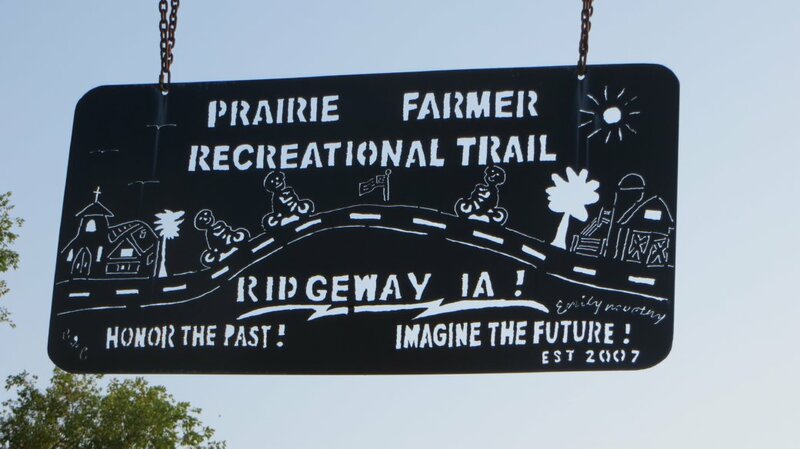 Having not ridden all year, the legs did not respond well at first but I was flying along by the 11th mile, reaching the town of Ridgeway, the halfway point in the trail. Metal sign marking the trail at the halfway point. It had taken quite a while to get to Ridgeway because there were so many mulberry bushes along the way. I lost count but would estimate having eaten eighty or so of the tiny berries. They are great stuff! Stopping at a little convenience store in Ridgeway, I bought some Gatorade G2 and two of those tasty but unhealthy packs of cheese crackers. That’s when disaster hit. The calves, quads, and hamstrings in both legs failed and started to lock up. Nearly all of the 11 miles back to Calmar were painful from the cramping. Massaging, water, walking, etc. did not help. There was little to do but ride back through the pain, even riding “bow legged” to keep the quads from cramping up. (Even now, two days later, I’m still pretty sore!) The sun was starting to go down at the same time. Thankfully, it was not in any hurry and there was time to get back. 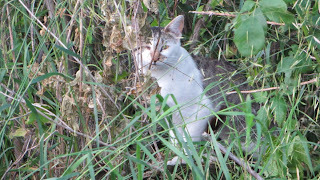 At mile 5 I heard a loud crying – a meow that sounded like desperation. Being a cat lover, I stopped for this little kitty and fed it my cheese crackers. 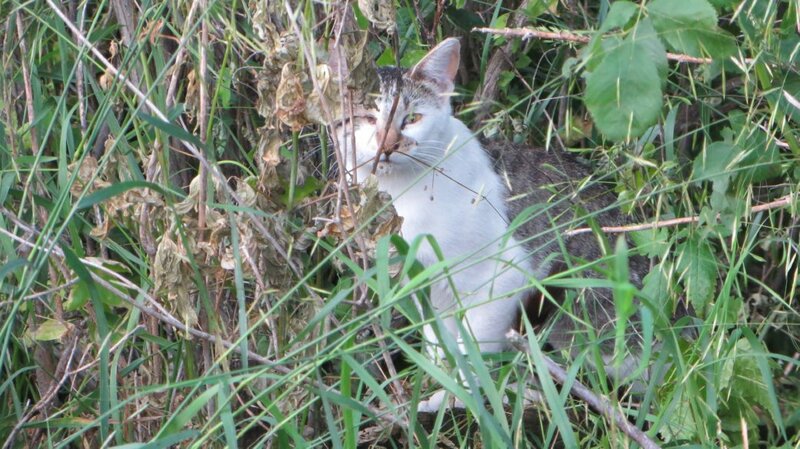 The cat was ferrel and would not come out but I was snapped this picture from a little ways down the trail as it started to emerge. Hungry cats will eat all kinds of things and this kitty was no exception. 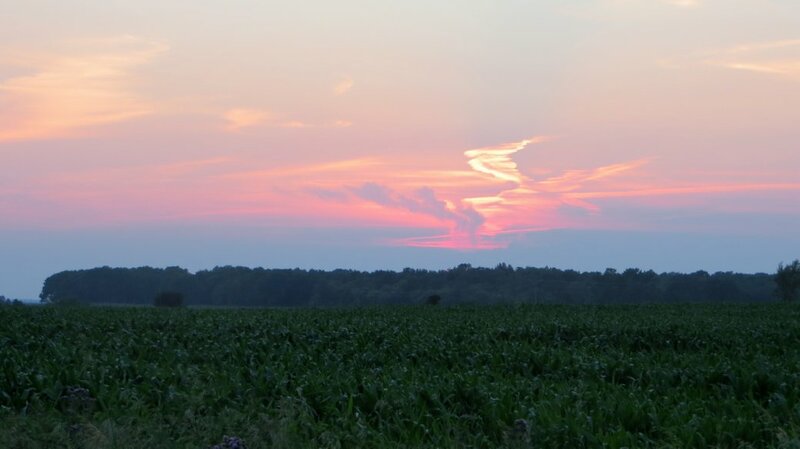 By this time it was close to sunset and I took these pictures looking back toward the west. The last few miles of the ride were tiring and painful. I played a numbers game with the mile markers… I would see mile 4 and think “I’m in the 3’s right now!” and eventually after seeing trail mile marker 1, I could say, “It’s less than a mile now!” Those little psychological games help. It felt good to get back and sit in the car, cooling off and letting the heart rate settle. It had been a terrific workout! I long to return and ride the full trail one day. The next morning brought more trout fishing – this time in Decorah – and I caught two more gorgeous trout. I cleaned the first one in the stream and, in slow motion, watched the second one slip right out of my hand and into the water, pausing to spin around in an eddy current before shooting through a rapids. He couldn’t escape the hook or death, but that fish still got the last laugh. It was time to get back home (the van) and rest. Despite the enjoyable trip, there were some lessons learned. This happens with almost every little trip. You find what works and what does not… what is right for you and what is not. Earlier this week I had contemplated converting the car to a living space, like what has been done with the van. This last trip changed my mind. The car could be made into a full time dwelling but it was wonderful to return home (to the Express van) and get a good night’s sleep. Yeah, I’m spoiled. The van’s new Simmons Beautyrest mattress beats the heck out of the Impala’s bucket seat! Thanks for stopping by. I hope everyone has a terrific Independence Day celebration. A lot of people sacrificed (and still do) to keep us free!